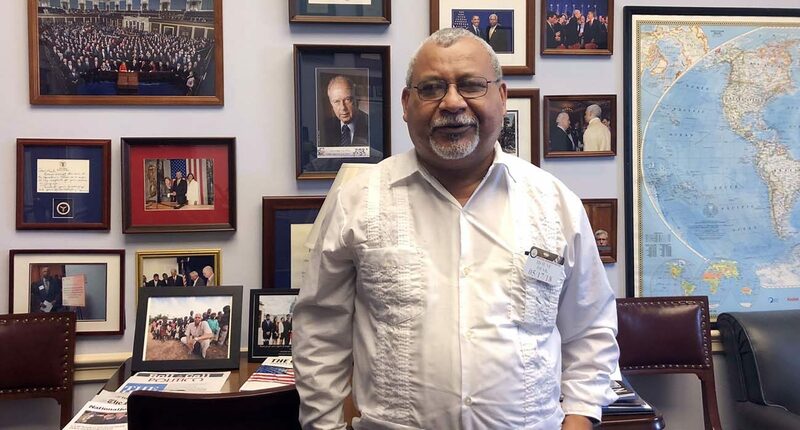 WASHINGTON (CNS) — Roaming the halls of the U.S. Congress is one of the last things Jesuit Father Ismael Moreno Coto imagined he’d have to do in his life’s work as a priest. “If I didn’t have to come, I never would,” said the Honduran priest, popularly known as Father Melo, during a May 17 interview with Catholic News Service on Capitol Hill where he was speaking with U.S. lawmakers about stopping military aid to the Central American country. That money, he believes, contributes to a government that not only practices repression on its citizens, but doesn’t do anything to stop the country’s socioeconomic ailments. Those ailments, he said, are behind the steady flow of Hondurans seeking to escape the chaos and heading north, so if the U.S. wants immigration to stop, it needs to stop the flow of money to a government making those conditions worse, he said. People don’t migrate because it’s fashionable, he told CNS, but because social conditions in Honduras have deteriorated. Many in Honduras, the second poorest country in Central America, are unemployed or underemployed, many are victims of extortion and gang violence, others have been displaced from their homes in the countryside by mining and hydroelectric projects, and others are simply fleeing a repressive government, said Father Melo. Father Melo met with many fellow Hondurans living abroad during a week-long visit in May to 10 U.S. cities that included gatherings with beneficiaries of the Temporary Protected Status, an immigration program that allowed some 57,000 Hondurans renewable work permits and reprieve from deportation. The Trump administration announced in early May that the protections for Hondurans would end in early 2020. “They said they were scared to return to Honduras, not because they don’t love Honduras but because they’re scared of the violence, the repression,” he said of his meetings with them. He shared those comments with U.S. lawmakers while also urging them to find a solution that would keep his compatriots safely in the U.S. until there’s improvement at home. If not, there will be consequences that also involve the U.S., he said. “What I said to them is ‘get ready to receive more migrants,'” if conditions in Honduras continue to deteriorate, he said. The U.S. has been supporting a group of Hondurans ruling the government who are “mass-producers of the poor,” he said. For his outspokenness, Father Melo has gained international fame as a human rights defender but also has become a target. In January, the Society of Jesus took the step of publicly denouncing “grave threats” against him, fearing an attack was imminent. Father Melo escaped a brush with death when two of his friends, Berta Caceres, a Honduran activist for environmental and indigenous causes, and Mexican environmentalist Gustavo Castro Soto were shot during the night of March 2, 2016. Castro was in town for a workshop and was staying at Caceres’ home in the town of La Esperanza. Caceres had called Father Melo that day to nudge him to visit her home so he could spend time with Castro, their mutual friend. “C’mon, Melo, come over so we can visit with Gustavo” were some of the last words she said to him, but Father Melo declined because he was too tired since he had just driven back from Nicaragua. When he woke up at 4 o’clock the next morning, he saw a lot of messages on his phone and then received a call from a friend. When Caceres visited the municipality of El Progreso, Honduras, where he lives, she’d stay with Father Melo’s mother or at the residence of his community. Father Melo has often publicly said the government is responsible for her death since she was opposed to government-backed projects in the countryside that were displacing indigenous and rural communities. Caceres often took to the airwaves of the Jesuit-run Radio Progreso to denounce what she considered injustices against the poor and indigenous. She was one of two people killed in the last four years associated with the radio station and an affiliated human rights center, but many more have been threatened, Father Melo said. The threats are not just physical but also involve a campaign of misinformation against him, his colleagues and their work, he said. Accusations of carrying weapons, planning to overthrow the government, public disorder, have been lodged against Hondurans who have spoken against President Juan Orlando Hernandez and what they call his “illegitimate” government. Though the constitution in Honduras limited its president to a one-time, six-year term, Hernandez sought and snatched a second term late last year and began that second term under a cloud of criticism and calls for his resignation. Some of those critics have been jailed. Father Melo has spoken against their detention and brought up the issue with U.S. lawmakers and the U.S. Department of State asking for help in freeing them. His actions on behalf of Hondurans are not without selfish motives, he said, admitting his fear, not just about what could happen to him but also to those he’s responsible for and close to. “It’s our lives that are in danger,” he said. Giddy naivete. They’re not escaping chaos. They’re coming for the same reasons as legal immigrants — free stuff.